Semtech Corporation (Nasdaq: SMTC), a leading supplier of analog and mixed-signal semiconductors, announced that its portfolio of 12G UHD-SDI solutions is enabling the LV5490 UHDTV waveform monitor LV5490SER06 option card from Leader Electronics Corporation (JASDAQ: 6867), a leading supplier of test equipment solutions to the broadcast industry. Leader Electronics’ LV5490SER06 option board provides a 12G UHD-SDI interface with eye monitoring and jitter measurement capability to the LV5490 UHDTV waveform monitor and utilizes Semtech’s GS12141 retiming equalizer and GS12181 retiming cable driver products. UHD-SDI is the only standardized broadcast UHDTV interface, and the GS12141 retiming cable equalizer and GS12181 retiming cable driver, with their advanced feature sets and class leading performance, provide a commercial, off-the-shelf interface solution for next generation UHDTV equipment and infrastructure. Semtech’s UHD-SDI products feature ultra-low power consumption and provide industry-leading performance at 12Gbps rates. UHD-SDI is ideal for UHDTV infrastructures, including routers, cameras, monitors, switchers and more. It offers pristine image quality, is backwards compatible with existing SDI systems and is standardized by both the Society of Motion Picture & Television Engineers (SMPTE) and the International Telecommunication Union (ITU), simplifying UHDTV infrastructure upgrades and reducing risk for broadcasters. Performance optimized: For 11.88G/s with ultra-long cable reach, enabling designs that offer maximum performance at all data rates (GS12141). Semtech’s portfolio of 12G UHD-SDI products will be demonstrated at Semtech’s booth N5024 at the National Association of Broadcasters (NAB) Show April 18-21 at the Las Vegas Convention Center in Las Vegas. The LV5490 will also be demonstrated at Leader’s booth C5109. 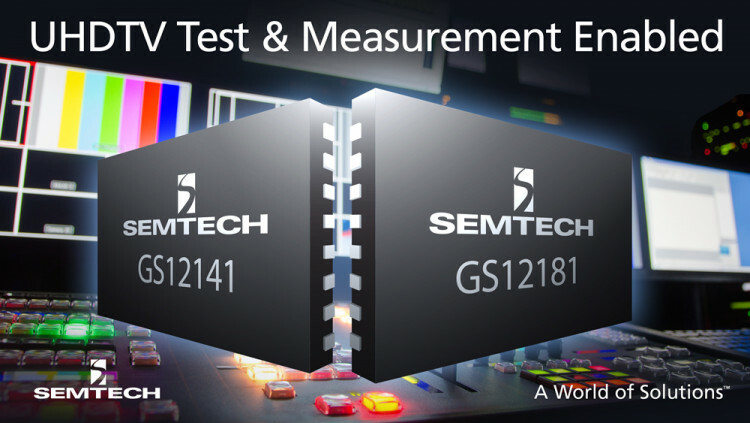 The GS12141 and GS12181 are available now. Semtech offers comprehensive design assistance, including field- and factory-based support. Data sheets, volume pricing and delivery quotes, as well as evaluation kits and samples, are available at www.semtech.com/info. Since its beginning 60 years ago, Leader has earned a worldwide reputation for designing and manufacturing some of the most reliable, practical and cost effective electronic instruments available. The products were originally developed for production testing and servicing. These are applications in which ease-of-use and highest reliability are essential. By expanding into a broad line of industrial and video instruments, Leader was able to add to these fundamental qualities a cost-performance ratio unequalled in the industry. Manufacturing quality is built in every step of the way. Only the finest parts are used for optimum reliability. At each production run, sub-assemblies are separately tested before they are integrated into the finished product. Then product is tested. Less than 1% of all Leader products made are ever returned for warranty repair or adjustment. More and more, Leader products, over 100 of them, ranging from 4K Waveform Monitors to rasterizers and video test equipment, are being specified for research, development, production and service applications in addition to over 100 instruments customized for production line applications. All statements contained herein that are not statements of historical fact, including statements that use the words “enables,””provides,””offers,” or “will” or other similar words or expressions, that describe Semtech Corporation’s or its management’s future plans, objectives or goals are “forward-looking statements” and are made pursuant to the Safe-Harbor provisions of the Private Securities Litigation Reform Act of 1995, as amended. Such forward-looking statements involve known and unknown risks, uncertainties and other factors that could cause the actual results of Semtech Corporation to be materially different from the historical results and/or from any future results or outcomes expressed or implied by such forward-looking statements. Such factors are further addressed in Semtech Corporation’s annual and quarterly reports, and in other documents or reports, filed with the Securities and Exchange Commission (www.sec.gov) including, without limitation, information under the captions “Management's Discussion and Analysis of Financial Condition and Results of Operations” and “Risk Factors”. Semtech Corporation assumes no obligation to update any forward-looking statements in order to reflect events or circumstances that may arise after the date of this release, except as required by law.